At the Cincinnati Children’s Hospital 3D printing is being used to treat children afflicted with rare skin disorders; People like Lily Hall, a 2 year old from Kentucky, who suffers from a disease—called nevus sebaceous syndrome—known to affect about 1 in 10,000 children. The disease is visible in sizable birthmarks all across the child’s skin, sometimes resulting in deadly skin cancers like basal or squamous cell carcinoma. Because of the dangers it poses, it’s imperative that Hall undergo surgeries to remove the marks from her body. To treat the disease, a silicone balloon, called a tissue expander, was inserted near one of Hall’s birthmarks to encourage the growth of new skin. 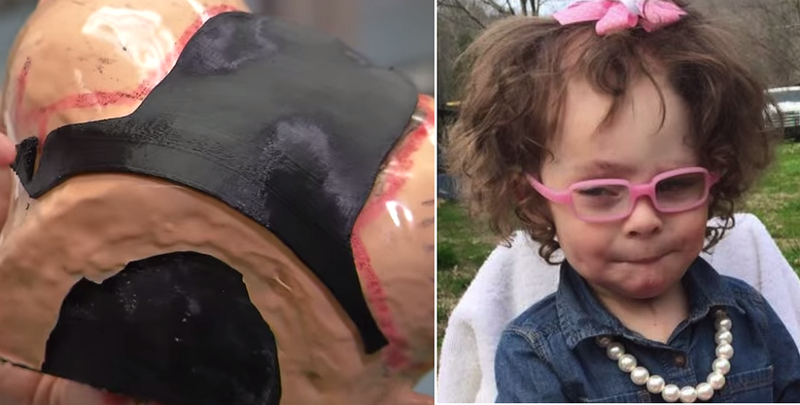 Over the course of months, the balloon would fill with the child’s own skin, until eventually, her disease-ridden skin would be surgically removed and replaced with healthy tissue from the expander. This approach would normally mean Hall would have to undergo many surgeries to remove and graft her skin. But by teaming up with clinical engineer Matt Banie, Dr. Thomas Sitzman (a plastic surgeon) was able to utilize 3D printing to lessen the need for more surgical procedures. First, Hall’s face was scanned by Banie to make a digital blueprint on a computer. Then, with the computer’s blueprint in hand, a 3D printer created synthetic skin to match the child’s face. This synthetic face essentially served as a practice model for Dr. Sitzman—one that took mere hours to reproduce. With the model, Dr. Sitzman was able to plan out the child’s future surgeries, which could ultimately lead to more targeted operations and less surgery for his patient. “You only get one shot with how you are going to do this surgery. Being able to model each individual patient’s surgery in advance is a tremendous step forward in how we care for patients,” Dr. Sitzman stated in a press release. Face transplants are another kind of surgery that takes advantage of 3D printing. Thanks to 3D printers, doctors have been able to work with replicas of a patient’s bone structure, artificial skulls, and maybe even bone grafts in time.